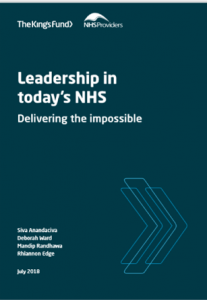 We recently read the above Publication from the Kings Fund which clearly highlights the challenges within the current NHS and the impact these challenges are having on leadership roles. Struggling trusts are less able to attract and retain strong leaders which in turn stands to have a negative impact on performance and the ability of the trust to better perform. What is the solution? Can we break this negative cycle? What can we learn and how can we support an NHS that continues to be challenged? © VIVARI Communications Ltd 2018.